Blade Marvel Comics Video Slot Guide & Review - Casino Answers! 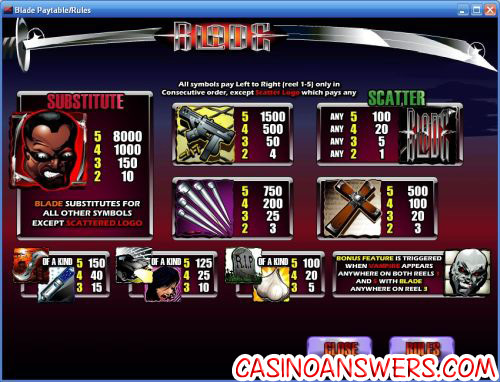 Blade is a 5-reel, 3-row, 9-line Marvel Jackpot Slot found at online casinos powered by Cryptologic. It’s a video slot based on the Marvel Comics, rather than the Blade film series. It has scatter wins, a free spin feature with expanding wilds and a three-tier progressive jackpot. 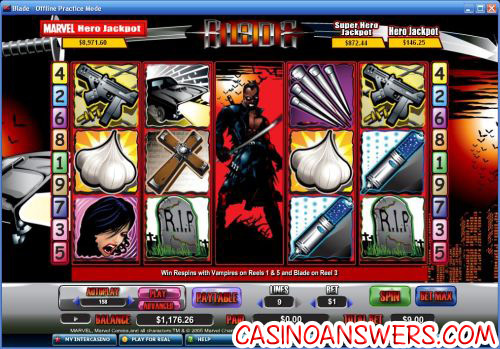 You can play the Blade video slot at [Americans: Unfortunately due to legal restrictions you are unable to play at any of the online casinos this game is at. We recommend you trying playing the unique slots at Win A Day Casino instead.]. Bets on Blade start at $0.05, but you can also bet $0.10, $0.15, $0.20, $0.25, $0.50, $0.75, $1, $2, $3, $4 and up to $5 per line. At all nine lines, this means you can bet up to $45 on a spin. Other features of Blade Marvel slot include an advanced autoplay feature (with stop conditions and the ability to play up to 999 spins) and a game speed setting. When the scary-looking bald vampire appears on reels 1 and 5 and Blade (wild substitute symbol) appears on reel 3 on the same spin, you will trigger the Blade bonus feature. You will win 5 free spins, which doesn’t sound like a lot but you can really get some good wins during this feature. The free spins are played at the same bet and lines as the triggering bet, so make sure to play all nine lines to maximize your winning potential. Another reason to play with all nine lines is the three-tier progressive jackpot that Blade and all Marvel Jackpot Slots are linked to. The Hero Jackpot starts at $50 and is usually won at slightly over $100 every hour or so. Its peak is just under $500. The Super Hero Jackpot starts at $500 and is hit every few hours. It can easily get into the multiple thousands. Finally, the big one is the Marvel Hero Jackpot starts at $5,000 and is usually won every few hours as well. It is commonly won at around $10,000, but can make it to around $25,000 before it is won! All of these jackpots are won randomly, so you don’t need to match any symbols to win. Just make sure to bet the most you can, as to maximize your chances of winning. If you are looking to take home one of the Blade progressive jackpots, you can sign up at [Americans: Unfortunately due to legal restrictions you are unable to play at any of the online casinos this game is at. We recommend you trying playing the unique slots at Win A Day Casino instead.]. Blade has a lot of positives, including the free spins feature and progressive jackpot. The negative is the lack of a bonus game, but the free spins feature does make up for that a bit. The free spins feature may be a little difficult to hit, but once you do trigger it, it will be worth it. We had a lot of fun playing Blade and think you will too. If you’re looking for a good place to play the Blade Marvel Comics slot, we would give our recommendation to VIP Casino. VIP Casino offers a signup bonus of 100% up to $225 along with 100% up to $150 monthly reload bonuses. Also, playing slot machines like Blade is the best and fastest way to clear these bonuses. To play the Blade video slot, sign up and make your first deposit today at VIP Casino! Which US-friendly casinos carry the Blade slot machine? Unfortunately, there aren’t any online casinos open to US players that carry Blade. Instead, you might want to try some of the exciting iSlots like Rock On at Rockbet Casino. Does the Blade slot at Cryptologic have a bonus game? There is no Blade bonus game, but there is a free spin feature with an expanding wild where you can easily get some really big wins. Blade marvel slot? Is there two blade marvel slots? Is there a slot machine based on the blade comic?